"How long is it since you were really bothered? About something important, about something real?" A recent Kill Screen article brought to my attention a policy travesty that raises serious concerns regarding accessibility to politically and socially relevant games. Following the completion of Endgame: Syria, a "news game" that seeks to simulate the stakes and strategies in the ongoing war in Syria, Apple rejected the title from the app store. According to App Store guidelines, the company forbids games that "solely target a specific race, culture, a real government or corporation, or any other real entity." This is, of course, the same sort of move that stirred up controversy when Apple rejected Molleindustria's Phone Story, which criticized systems of oppression behind smart phone supply chains - including, of course, the iPhone. However, the rejection (which came after first accepting the game) cited "excessively objectionable and crude content", making a moral judgement on behalf of the company's consumers. This is the same infringement, by the way, that was cited in Apple's rejection of Drones+, a sparse and non-sensational app that aggregates US drone strikes around the world from a public database. In all three cases, Apple's relatively small number of quality control staffers act as moral policemen, safeguarding consumers' sensitive constitution. As a vehement proponent of the principle of free speech (and here I mean the value of open conversations, not just the legal right), I find the assertion that a third-party can so assuredly patrol the border of offensive and non-offensive a ludicrous idea. It has never been easier to self-censor for ourselves. With the amount of sites that cater to all sorts of consumers, from conservative parents to religious communities, we all have more than enough ways to protect our own moral boundaries. Of course there are plenty of other reasons for Apple to protect their consumers from potentially offensive games. Their policy against any "real world entities" could be a sure-fire way to protect themselves from criticism. Alternatively, the company could be concerned that users might associate offensive content with Apple's brand, thereby harming the "App Store" brand itself. Yet the term has already become so ubiquitous (despite Apple's legal effort to maintain brand hegemony), that there is hardly an alien concept that the app store functions more as a massive library than a finely pruned garden. In fact, I think we should start thinking of app stores as libraries. 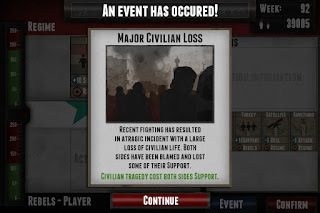 With smart phones in nearly everyone's an ever-increasing amount of hands these days, mobile platforms are one of the easiest ways to access a huge player base, both those less knowledgeable about accessing and/or playing games from PCs and those such political games may seek to reach. 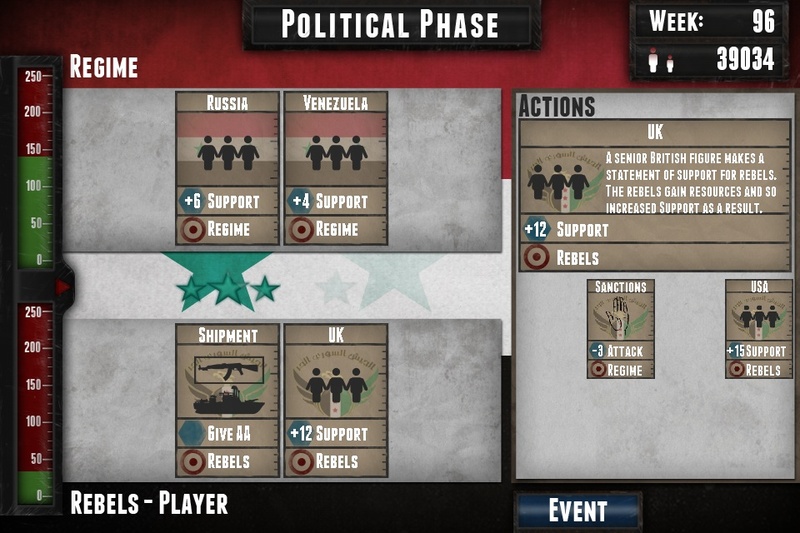 The decision to not carry Endgame: Syria is a huge blow not just to the game creators, but to those seeking to use games as educational and persuasive objects. Yes, Apple has every right to decide what products are available in their collection, just as many schools across the US maintain the right to manage their own collections. That being said, when a library or school bans a book, they are almost universally condemned. Apple's policy preventing political, social, or any other critical game with firm foundations in the real world is devastating and shameful. Again, I am not suggesting Apple should lose their right to decide what can and cannot appear in their app store. Indeed, I am less concerned about Apple and more concerned about how we approach the distribution and accessibility of games as a whole. Yes, I think the policy reprehensible, but the company will not be the last to avoid scrutiny by suppressing controversial works. As games become an increasingly important medium for politically and socially relevant messaging, we should seriously consider what the future holds for our freedom to play. In the meantime, we should also remember why banning books seldom works. When a library bans, say, Catcher in the Rye, demand remains, or even grows. Thanks to stalwart librarians, parents, students, and others, the works are made accessible through other means. To that end, and with no judgement on the quality of the work at all, Endgame: Syria is free to download for Android via Google Play and is playable online at GameTheNews.net. "With smart phones in nearly everyone's hands these days, mobile platforms are one of the easiest ways to access a huge player base, particularly those less knowledgeable about accessing and/or playing games from PCs. " Who is "nearly everyone" in this sentence? Smartphones may be seemingly ubiquitous, but a quick Google search suggests penetration is close to 50%, and those phones do not necessarily play games. That number is almost certainly skewed heavily towards certain demographics. I don't mean to contest your general point that lots and lots of people own smartphones, but when we're talking about "accessibility" it is, I think, very important to define exactly who we're talking about. Video games are, traditionally, quite exclusive. Even if Apple reversed its decision and made Endgame: Syria available on the app store, we're talking about "accessibility" to people who have significant disposable income, credit cards, bank accounts, etc. You could also get into more fundamental assumptions here, like English literacy, game literacy (Endgame is relatively complicated), math ability (Endgame requires not-insignificant math skills), etc. There is a lot to say on this subject but my general thought is that video games, among almost all media, are uniquely *in*-accessible, and actions like this Apple ban are almost negligible in the grand scheme of things. Any gamer who wants to talk seriously about censorship and distribution of games needs to step completely away from traditional distribution models. Home consoles and smartphones shouldn't even be in the equation until some basic criteria of accessibility are met. You're definitely right, "nearly everyone" is completely hyperbolic. I'll tone it down accordingly. All that aside, this is also about popular consciousness and the cultural ubiquity of smart phones. We can argue, of course, that the plenty of destitute are left out of conversations like these because, as you rightly point out, video games are quite inaccessible relative. But this is more of a consider Apple's policy as more than "negligible". What iOS consumers have access has a cultural effect. Indeed, if we are going to reach anyone with political messages and criticism, if anyone needs to play games like Phone Story, isn't it exactly those whose access to such devices comes easily? @Grayson Davis make several great points about this. For as much as we might rail against Apple for this (and other) App store exclusions, we are always writing and talking about a segment of the overall consumer market that is privileged in a number of ways, as was detailed quite nicely. That written though, there are other conversations to have around your post that are more within my realm as a indie developer. While I love the idea of thinking of App stores as libraries, the metaphor doesn't quite work for me. For one, the iOS market is not only a closed-garden, but you have to buy the very tools to till the garden from Apple too: it runs a proprietary OS and the store is an integrated part of the experience of using the device. Now, sure, there are more open platforms like Android, but that openness is limited by the carrier, device, and even version of the software. Excluding that for a moment, licensing issues are the other big problem here. The laws around a physical copy of a book and a digital one are vastly different. For one, you can easily hand a person a dead-tree version, for the other, well, it often depends on the DRM, device (again), and what you "signed" to read the book. So, to stretch the metaphor even more, it's more like a museum that anything else. You pay a fee to see some sights, and you might even walk around for an extended about of time, but you don't "own" anything in that sense. The museum, or in this case marketplace/platform holder, does. They let you in, limit your control, and only show off the works they want others to see. Is that fair? No. It is all the things you wrote, "protect... from potentially offensive games... [and] from criticism." Apple takes actions to protect Apple. It's a commercial entity, they do those things. To return to some semblance of a point though: yeah, it's worrisome. As a developer who looks at that platform (as well as others), it's very worrisome. Not only do I have to juggle the commercial/creative problem, I have to think about the gatekeepers too. Plus, there's the privilege problem of interpreters versus parsers, but that's more of a coding conversation. Anyway, we need to have these conversations. We need to worry. And, yes, we need to question the markets, their practices, and how "free" we really are to play these interactive cultural manifestations we call "videogames". Good job. Great point. I like the museum metaphor a lot. These types of conversations, even about what metaphors work and don't, is great too. For all the reasons you astutely mention and more, games are a very unique. Which is precisely why voicing such concerns is so damn important, even if it's just to shape the direction and tone of the conversation towards easier access to critical and non-critical games.